Product prices and availability are accurate as of 2019-04-10 15:16:45 UTC and are subject to change. Any price and availability information displayed on http://www.amazon.com/ at the time of purchase will apply to the purchase of this product. 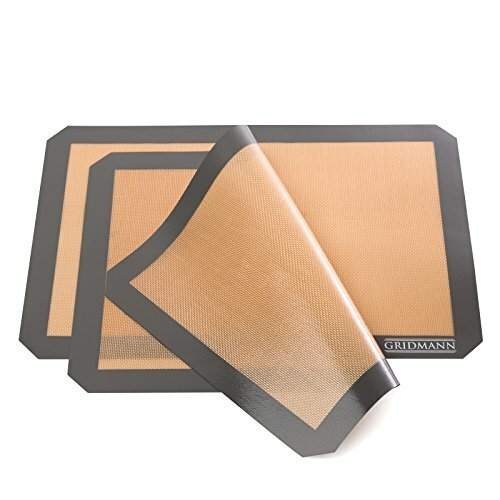 These non-stick, premium food-grade silicone baking mats are the only items missing from completing your dream kitchen, transforming everyday baking and roasting into a convenient, healthy, and cost-effective experience. Flexible, lay-flat design is highly durable and extremely versatile. 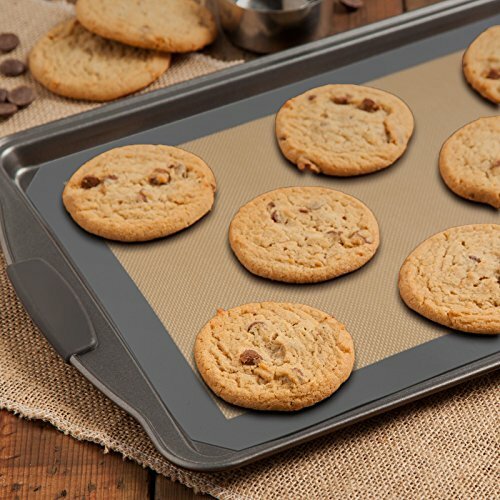 Simply place this BPA Free baking mat (measuring 16-1/2 by 11-5/8 inches each) directly onto any half-sheet pan or sheet and stick into the oven, up to 480 degrees F.
Providing improved air circulation and even, consistent heat transfer, these silicone baking mats help ensure perfect results, including golden-brown breads, fluffy cakes, juicy roasts, crisp yet tender vegetables, and much more. 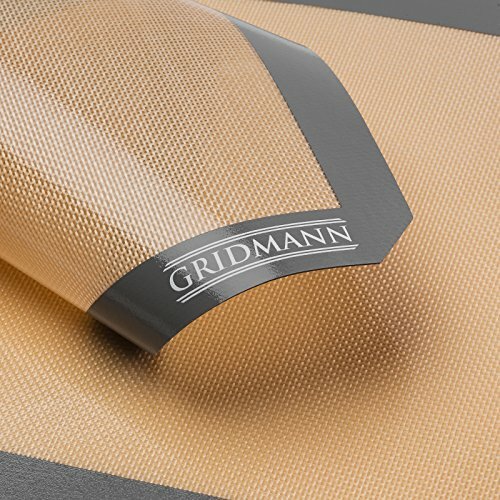 Gridmann is your trusted source for professional-grade kitchen bakeware and accessories that provide lasting quality and exceptional value. 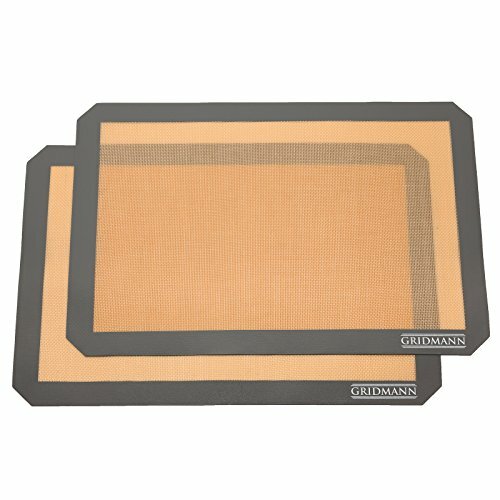 PREMIUM QUALITY DESIGN: Made from durable, flexible, food-grade silicone that is oven-safe to 480 degrees F, this two-pack set of baking mats provides the ultimate convenient and healthy way to upgrade baking and roasting. Turn any half-sheet pan into a non-stick surface, eliminating fattening oils, grease, messy sprays, and expensive parchment paper for clean, effortless food removal without waste, hassle, or extra calories. 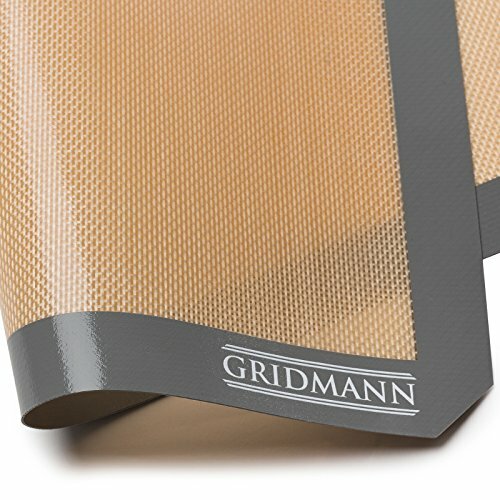 BETTER BAKED GOODS: Designed for use in all types of ovens (except direct-fire ovens), these professional-grade (BPA Free) mats can be used with pans or sheets to improve overall heat distribution and air circulation, for even and consistent results, with no burned or undercooked spots. REUSABLE & ECONOMICAL: These eco-friendly, non-stick mats can be used again and again, therefore saving money on sprays, oils, and butter plus parchment paper, aluminum foil, and other standard pan and sheet preparation materials, as well as eliminating waste after use. HIGHLY VERSATILE: The baking options are nearly endless with these handy non-stick mats, including cookies, sticky caramels, gooey bread, or even baked fish. They are a baker's dream at preventing messes, catching drips and spill-over from bubbling casseroles or pies. These mats are also resilient enough to handle metal spatulas or utensils without damage (avoiding serrated edges), unlike other pans and baking sheets prone to scratches and wear. EASY-TO-CLEAN: Forget about scrubbing baked-on foods, and save time and effort with these non-stick mats that wipe clean quickly and easily with soap and water. Also dishwasher safe (top rack only).